If you’re shopping for new office supplies for your foodservice business or corporate building, our selection of staplers is a great place to start. Additionally, you’ll find plenty of staples and stapler refills to keep your staplers full and ready to use. We even offer staple removers that allow you to separate papers that were previously stapled together for reorganization or shredding. Also make sure to check out other great items from Arrow, Bostitch, Leitz, MAX, PaperPro, Rapid and Swingline. A few of these products have a power assist feature that allows them to staple large quantities of paper at a time without the chance of user fatigue. Many of these staplers can also be opened for bulletin board tacking and use while crafting. Best of all, these staplers, staples, and stapler refills are sold at affordable low prices that allow you to purchase all of the office supplies your establishment needs without exceeding your budget. For related products, check out our specialty paper, cash register paper, and Post-It and sticky pads. 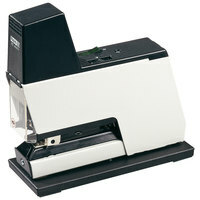 If you're wondering where to buy rapid staplers, we have a large selection of rapid staplers for sale at the lowest prices.